This week, a client pulled an adorable little pod out of her fridge, handed it to us and said, “have you tried this?” Oh, chia pudding! Never tried the store bought type, but I DO have chia seeds and often throw them in my smoothies. I asked my friend, cook, fellow vegetarian (and fellow biker) Zilya Schaffer if she had any great SIMPLE chia pudding recipes to share, and after trying it (yum), we thought we’d share it with you. Just whisk this together, so you still have whole chia seeds (it ends up with a similar texture to a small-grained tapioca) or blend it in a blender until smooth. Chill for a few hours and you have a tasty, healthy treat! If you choose to blend it, it would be best to leave out the cacao nibs, or add them at the end for a little chocolate crunch. Top with fresh or frozen berries and some chocolate sauce for a tempting dessert. Add to hot oatmeal just before serving. 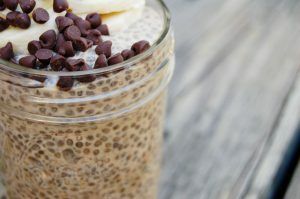 How do you love your chia pudding? Tell us in the comments below!